The 3rd annual, 2018 California-China Business Summit (CA-China Business Summit) was held in Los Angeles on May 3rd at the Beverly Hilton Hotel. With a focus on further advancing California-China business ties, the summit promotes and deepens the economic and trade cooperation on the local level. Governor Jerry Brown delivered the keynote speech. 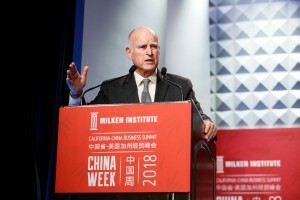 He emphasized that the potential for economic and trade cooperation between California and China is enormous, noting, California is the key engine of US economy and stands to be a place of collaboration. Both sides can carry out more cooperation in clean energy, environmental protection and many other aspects. “In promoting China-US trade relations, cooperation between provinces and states plays an indispensable role. Business leaders from US and China are the key players in bilateral trade and investment promotion. At this pivotal moment, hope you all can play a more active role in deepening mutual understanding and bridging between the government and business communities,” said Minister Zhu Hong, Minister for Commercial Affairs, Embassy of the People’s Republic of China. Zhang Ping, Consul General of the People’s Republic of China in Los Angeles delivered the opening remarks. 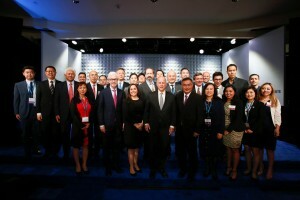 He stated that California is an important participant and active supporter of China-US economic and trade cooperation. For the past five years, the economic, trade and investment cooperation between California and Chinese provinces and cities has fruitful results. In 2017, California’s total trade with China ranked first in the United States, reaching US$175.6 billion, an increase of nearly 20% from 2013. In terms of investment, California has been the state that attracts large number of Chinese enterprises. Chairman of CGCC-Los Angeles, Vice Chairman of CGCC, President of AVIC International USA, Sherman Zhang said, Chinese enterprises in the U.S. have created considerable job opportunities and promoted the growth of local economies. As of 2017, CGCC Chinese member companies have cumulatively invested over $120 billion and directly employ more than 200,000 and indirectly support over 1,000,000 people throughout the US. 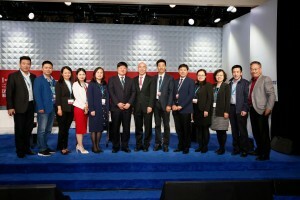 The summit attracted more than 500 attendees including US-China business and government leaders, delegations from seven provinces and cities in China. 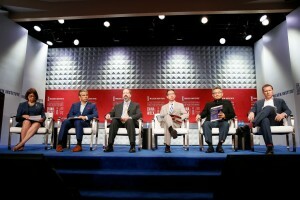 Four panel discussions around the topics of clean technology, e-commerce, advanced manufacturing, and artificial intelligence were conducted at the summit. 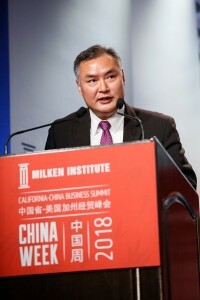 2018 California-China Business Summit was co-organized by the Milken Institute, ChinaWeek and the China Chamber of Commerce for Import and Export of Mechanical and Electrical Products; sponsored by the China General Chamber of Commerce Los Angeles.